Throughout history people convicted of crimes have denied their guilt. Henri Charrière, nicknamed Papillon (French for butterfly) for the butterfly tattoo on his chest, is no different. This in itself doesn’t make the man interesting. What piques the interest is his accounts of his incarceration at French Guiana and his escape from the infamous Devil’s Island. He authored a book, Papillon, in which he gives detailed information of the hardships, cruelty, escape attempts and the eventual successful escape to freedom. Therein lays the controversy. How factual are Papillion’s accounts? For all of the information available about Papillon’s life in prison; there is little information about his life before he was sentenced to life in prison. He was born on November 16, 1906 in Credit: Source: Celebrity PhotosArdèche, France at Saint-Étienne-de-Lugdarès. His mother died when he was ten and it is assumed his two older sisters cared for him. When he was 17 years old he joined the French Navy. After a two-year stint, he left the navy and became involved in the Paris underworld. In the underground, Papillon was a thief, a safecracker and some say, a pimp. In 1931 shy of his 26th birthday, Papillon was convicted of murdering pimp and alleged police informant, Roland le Petit. To his death in 1973, Charrière denied his guilt of the murder. He didn’t deny other unlawful acts, but insisted he did not kill Le Petit and railed against the bias of French justice. According to Charrière, the main witness against him, Polein, was perhaps given a deal by the police to falsify information in exchange for a “look the other way” of his own crimes. The witness was presented as “squeaky clean,” but years later was arrested and convicted of cocaine trafficking. The entire trial took only one day. (Charrière had already been jailed for about a year before brought to trial). The verdict was guilty and the sentence—hard labor for life. In 1852 the islands became part of a penal colony for France. The main section of the colony extended along the border between French and Dutch Guiana. (Today Dutch Guiana is known as Surinam.) The most well-known of the islands is Devil’s Island. This part of the penal colony was designated for political prisoners with Alfred Dreyfus the prisoner most identified with the island. The general population of the worst criminals was sent to Ile Royale; the worst of those prisoners was sent to Ile Saint-Joseph for solitary confinement where they were subjected to silence and extra punishment in darkness. The penal system had a reputation for its brutality and harsh conditions. The islands needed few guards, because as far as the administration was concerned, they were inescapable and if prisoners tried, they were subjected to severe punishment; that is, if they made it out of the shark infested waters. If escapees were able to navigate the water and reach land; the jungle awaited and with it, disease and vermin. In addition, once prisoners finished their sentences and returned to France, they told of the horrors in the penal colony and further advanced its reputation. Le Bagne (French for penal colony) came out of the French Revolution of 1789-1794. While many opponents of the authority were sentenced to the guillotine; many ended up in the Le Bagne on the Atlantic coast of South America. The colony at this time was in reality, a place for political dissidents. At the conclusion of the revolution, the prisoners were set free and the prison was abandoned for a number of years. After the revolution all criminals were held in prisons in France, but in 1850, Prince Louis Napoléon decided the 6000 inmates held at the time were an enormous burden on the budget and the prisons were not doing much except giving the prisoners an environment to become more immoral. Deeming the inmates a worse potential for threatening society than they already were; Napoleon decided hard labor in the development of the French colonies was the answer. On March 31, 1852, 298 inmates were shipped to the newly restored Le Bagne in French Guiana. During its years of operation, the colony held 70,000 prisoners, of which 530 were women. The beginning of the road to the penal colony was a stay at the Ile de Re, just off the coast of France. Prisoners, once convicted, were sent there to await transport to Le Bagne in French Guiana. The prison ships, the "La Loire" and the "La Martinière, made the voyage twice a year—in December and July. Marching the prisoners to the waiting ships was an event of sorts, with family and friends gathered to give a final wave to loved ones as they were paraded down to the harbor. The prisoners were kept in large cages on the ship and the voyage was long; usually three weeks. They arrived at Saint Laurent-du-Maroni where they were given a medical examination and a camp uniform. The prisoners were then divided into categories: political dissents were sent to Ile Diable; criminals who had already served sentences in prisons in France (but were considered threats to society) were left in Saint Laurent; and the remainder (which was the majority of the prisoners) was sent to one of 20 hard labor camps. The most dangerous of the criminals were sent to the camps of Charvein or Godebert. There, the inmates were subjected to inhuman treatment by sadistic wardens and guards. The labor generally entailed building infrastructure or clearing forest. Inmates who refused or were unable to do the job were beaten and denied food and water. Most of the inmates perished under the conditions. Those left at Saint Laurent (called the Relégués or the regulated) had few constraints. They could move about the settlement and some were allowed to roam the entirety of French Guiana. They were left to fend for themselves which caused additional problems as the prisoners found ways to survive. Credit: Photo credit: John Hill- GFDL, CCA-by SA 3.0, Source: Wikimedia CommonsDiscipline in the colony was severe. The most serious of offenses was met with the guillotine. The smallest offenses put the prisoners in complete silence at night and work during the day for six months to six years on the Ile Saint-Joseph. One step up from that punishment was solitary confinement (also on Ile Saint-Joseph) in which prisoners were kept in complete isolation for five months to five years. Prisoners were also kept in complete silence. Ceilings were a steel grate so guards could keep permanent watch on prisoners. If the confined prisoner dared to speak or make any noise, the grate was covered with a plank to block out any light. Once a month, the prisoner could extend his head out through a hatch so he could be shaved. One of the offenses earning a prisoner a stint at Saint-Joseph was attempting to escape. Any escape attempt had to go through one of three routes: through the jungle, up the Maroni river, or out to sea. Each had perilous aspects which made the escape unlikely to succeed. In addition to the natural obstacles of escape, the regulated prisoners were often an obstacle. Also, prisoners who finished their sentences were required to stay in French Guiana for as many years as their sentences before returning to France; those who had sentences eight years or longer were required to live permanently in French Guiana. With few resources, they, like the regulated prisoners, often made a living turning in escaped prisoners for rewards or swindling prisoners by agreeing to help with an escape only to turn them in or not follow through on agreed assistance. Credit: Photo credit: John Hill- GFDL, CCA-by SA 3.0, Source: Wikimedia CommonsLiving conditions in the colony was, by all accounts, atrocious. The prisoners were poorly clothed and fed which led to accessibility of diseases and parasites. Tuberculosis claimed numerous inmates as did leprosy. The hard labor further depleted their bodies’ ability to stave off diseases such as malaria. Fighting and assaults among prisoners were common which further injured the prisoners. Up to the point of his conviction, there is little controversy of Charrière’s account of his life. Once he begins his story of imprisonment, the facts became suspect and challenged by numerous people. There is no question he was sent to the penal colony in French Guiana. What many have trouble with is his accounts of what happened at the penal colony. In 1969, Charrière wrote the book Papillon, which he claimed was his autobiography, though acknowledged it was “about 75% accurate and true.” The book was a best seller and translated into most of the major languages. In the book, Papillon (or Papi as he was also called by "friends" in prison) describes his life at the prison and gives details of his escape attempts and eventual success at gaining freedom. According to Papillon, almost immediately after the sentencing, he planned to escape. According to Papillon, he met Louis Dega in the French jail while they awaited transport to French Guiana. They made a pact by which Papillon would protect Dega once they arrived at the penal colony. They were transported on the prison ship, the La Martinière to French Guiana. After an eighteen-day horrendous voyage, the prisoners arrived at the infamous penal colony. Credit: Source: ilesdusalut.comIt is here where the line between fact and fiction seem to be blurred. Many critics of Papillon’s accounts of his imprisonment, escape attempts and eventual successful escape, site the inaccuracies and other former prisoners have vastly different versions of life at Le Bagne. Some suggest Papillon used their stories and attributed them to his own life. On the advice of a former prisoner who had been recaptured and sent back to Le Bagne, Papillon was quick to make “friends” with a worker in the infirmary. This former prisoner, Julot, was already in the hospital and was ready to escape with Papillon. However, Julot made his attempt before Papillon. In his book, Papillon claims he later saw Julot as an old man after Julot escaped from Cayenne (labor camp). Papillon, Dega and another prisoner, Fernandez, were in the hospital planning their escape. Into the third week at the hospital, another inmate, Joanes Clousiot, came in and joined in Papi’s escape plan. They decided to use bed legs to knock the guards unconscious, climb over the hospital wall, dive into the river and float with the current. The plan changed slightly when another inmate agreed to help secure a boat. Fernandez and Dega left the hospital, unwilling to go with Papi’s plan. Papillon and Clousiot got another inmate to join in their plan. 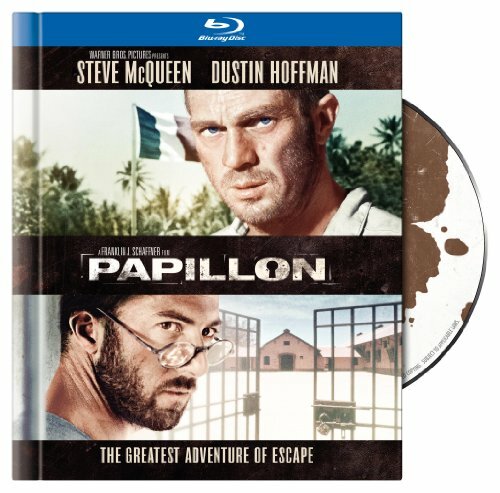 The escape from the hospital is detailed with Papillon knocking out most of the guards. The three launched over the wall and Clousiot brokes his leg in doing so. They managed to get away but the man who was helping them, conned them by giving them a wrecked boat. They are helped by another former inmate and a community of lepers. The trio landed in Trinidad where they were welcomed by an English family. Later they set off again and ended up in Columbia where they were imprisoned. Papillon escaped with another prisoner and landed in an Indian camp in Guajira. Papillon stayed in the Indian village for about seven months. He left the village and went to a convent where he ended up in the hands of the Columbian Police once again. He spent many months in various prisons in the country before he was extradited back to French authority and the penal colony in French Guiana. For almost a year Papillon had been free of the dreaded penal colony, though not always a free man. Upon return, the prisoners were initially chained in a communal cell awaiting a tribunal destined to sentence them to five years in solitary confinement at Saint-Joseph. Papillon explains how he represented himself and his two cohorts at the tribunal. During their confrontation at the tribunal, Papi was required to give an account of their escape and their lives during their time away from the penal colony. He was allowed to represent their defense and asked the tribunal to set aside the charge of attempted murder. His reasoning was he and Clousiot were big, strong men and could have easily killed the hospital guards; however, they had wrapped the iron bed legs in cloth as to soften the blow and the guards did not even require hospitalization. He further asked the tribunal to reduce their solitary confinement sentence because the prisoners were already serving life sentences, were young and escape attempts were not unreasonable to expect. The president of the tribunal did lay aside the attempted murder charge and gave the men a two-year solitary confinement sentence. Credit: Source: ilesdusalut.comAt the young age of 28, Papi began his two-year confinement in absolute silence. Shortly after the incarceration, Dega and another friend began to smuggle in coconuts and cigarettes. One year and eight months later, the guard pushing in the pail that held the contraband was caught. Papillon was put on half-rations. When questioned about the contraband, he feigned amnesia. It was the fake amnesia that allowed him to be released when his two years were finished. He and his cohorts were sent to the hospital on Ile Royale. It wasn’t long before Papi was planning another escape. However, as fate would have it, he got caught and ended up killing the man who “ratted” on him. This cost him another eight-year sentence in solitary. This time, according to Charrière’s account, the prisoners were allowed some time out of the cell and medical attention. He ended up serving nineteen months of his sentence before being released early for attempting to rescue a drowning girl in shark-infested waters. After a stint in the asylum (Charrière faked being “insane” so he could go to the asylum where Credit: Source: ilesdusalut.comhe had another failed escape attempt, though prison guards were none the wiser), Papillon positioned himself to be sent to Ile Diable. He believed it was from this island he would make a successful escape. At this time, Papillon was thirty-five years old; he had made eight escape attempts with one halfway successful when he was free for seven months. Credit: Source: ilesdusalut.comOn Devil’s Island, Papi spent many hours sitting on “Dreyfus’ Bench;” a smooth rock the well-known political prisoner Alfred Dreyfus had sat on during his stint on the island. Latching two bags of coconuts together, Papi made his final escape attempt by throwing the “raft” into the ocean and jumping in after it to be carried out to sea. Landing in Venezuela, Charrière and his companions were once again imprisoned. This time, he decided to accept his fate and not attempt an escape from the Venezuela labor camp. A revolution ended up setting him free. He was given an identification card stating he was a resident of Venezuela. The year was 1945. Without researching the facts regarding conditions of prisons and the hierarchy of the French penal system, it is somewhat difficult to ascertain which part of the book is the “75%” true facts and which is the “25%” fiction. Taking the details of his life on the surface of what he’s written in the book, Papi would have you believe he was a fairly powerful and respected man at the French Guiana penal colony. 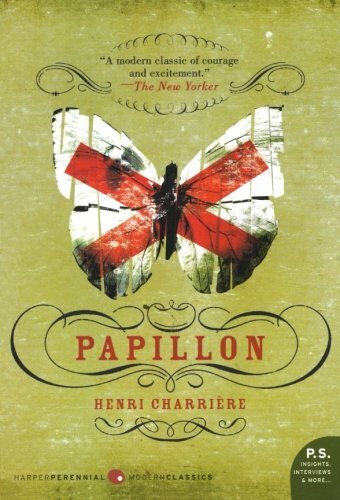 A year after Charrière’s book was published, Gérard de Villiers published Papillon Epinglé (Butterfly pinned) in which he refuted much of Charrière’s accounts of what happened. He claimed only about 10% of the book was accurate. In Villiers’ book, interviews with other inmates, guards and officials as well as a review of available documents and records, revealed many of Papi's stories are actually from the lives of other prisoners. It depicts the prisoner, Papillon, as more of a “run of the mill” inmate who didn’t make waves. Publisher, Robert Laffont, said in an interview in the 1990s, the book was submitted as a novel with parts borrowed from other sources. Deciding who is most accurate in their accounts of life in the prison colony is sketchy at best. By Flag’s own admission, his life was more “cushy” than many of the other prisoners so he may not be the most objective. Charrière claims 25% of his story is fictional, but which parts? The solitary confinement may have been true in the early 1900s, but by the time Papillon arrived at French Guiana, conditions had progressed according to records and documents. In Villier’s book, he documents regulations citing assault of guards resulted in a death penalty; thus, Papi’s account of knocking out three guards and receiving no punishment for that particular part of his escape is suspect. How did Henri Charrière manage to survive and escape from the penal colony in French Guiana? Credit: Source: bookworm.com We may never know the true story, but his book does make an interesting and entertaining read. The movie captures much of the high points in the book, though does stretch the adventures even further than the book’s account. Henri Charrière lived out his life in Venezeula, until his death in 1973. He was married and was the owner of two restaurants, one in Caracas and one in Maracaibo. He was considered somewhat of a celebrity in Venezuela. He wrote a follow-up book, Banco,about his life after prison. In the making of the movie based on his book, Papillon served as a consultant on location. Did he escape from Devil’s Island on a bag of coconuts? Until his death he maintained he was innocent and he did escape Devil's Island on a raft of two bags of coconuts tied together. Read the book; you decide—true story or entertaining fiction? The copyright of the article Papillion’s Escape from Devils Island: Fact or Fiction is owned by Cheryl Weldon and permission to republish in print or online must be granted by the author in writing. Trailer for the movie "Papillon"
Thank you for the kind words and the read. The one thing I took away from Papillon's story (when I first read it) was that, unlike, say, the prisoners who escaped from Alcatraz once upon a itme, was that he had a LOT of help (and he was able to bring money in with him and grease the wheels, so to speak). The story is still a good one, though not as "underdoggy" as people like to believe. Good piece! A thumb! I agree Vic, he did have a lot of help and money. I believe he didn't make the "heroic escape" as he described. There's no question he escaped, but I suspect it was a lot less dramatic as he tells. Regardless, I suppose any escape would be noteworthy. Can't imagine anyone sticking their head out the top of a steel grate to be shaved. Definitely would be motivated to escape on two bags of floating coconuts if it happened to me. While that was in the movie, in the book, he doesn't say that. Thanks for the read. Henri CharriÃ¨re translated from the French by Patrick Oâ€™Brien Papillon. New York: Harper Collins, 1970.